Sesriem is a small settlement located in the Namib Desert, in Namibia, close to the southern end of the Naukluft Mountains. It is especially known because the "Sesriem gate" is the main access point to the Namib-Naukluft National Park for visitors entering the park to visit the nearby tourist attraction of Sossusvlei. As many "settlements" in the Namib, Sesriem is essentially a filling station with basic services such as public telephones and a couple of small kiosks where travellers can get general supplies such as food and water. In the surroundings of Sesriem there are several accommodations, such as a few lodges (e.g., "Le Mirage Desert" and the "Sossusvlei Lodge") and at least 24 campsites for backpackers.By the Sesriem gate, hot air balloons depart in the early morning, providing scenic flights over the Sossusvlei dunes.Sesriem CanyonSesriem is also known for the Sesriem Canyon, about 4 km from Sesriem itself, which is the second most important tourist attraction in the area after Sossusvlei. It is a natural canyon carved by the Tsauchab rivier in the local sedimentary rock, about a kilometre (0.6 mile) long and up to 30 meters (100 feet) deep. The name Sesriem is Afrikaans and means "six belts", given by settlers on the Dorsland Trek who had to attach together six belts (made of oryx hides) in order to reach buckets down into the canyon to scoop up water. 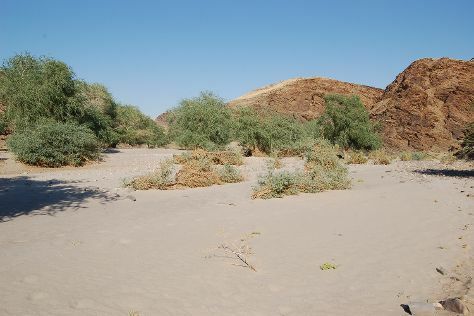 The Sesriem Canyon is only two metres (6.5 feet) wide in some places, and has a portion that permanently contains water, which many animals use. Sesriem is in Khomas Region. Add Sesriem and other Namibia destinations to your travel plans using our Namibia trip maker .